21 Problems Short Girls Encounter On A Daily Basis! Todays post is something I very much enjoy reading myself, so I thought I would create my own list! I always laugh so much on this kind of post because every point I’m like yes yes yes yes yes they all apply to me…. People may not know this because you can hide behind a blog, but I am only 5’1 and I have been for about 10 years. All I have heard is ‘You will grow soon’ I still haven’t had that growth spurt I am afraid! 1. 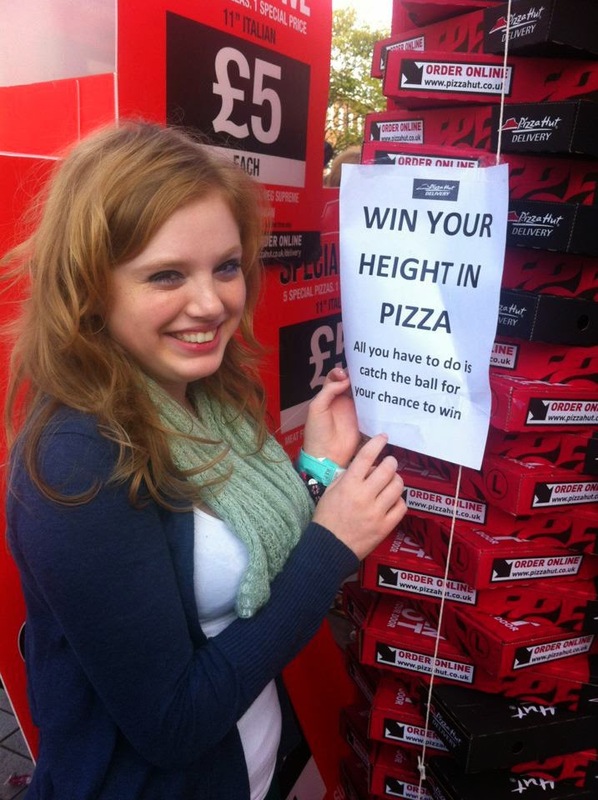 My photo – (Really Old) “Win your height in pizza” not exactly fair really……. 2. Heels. You feel obliged to wear them on a night out to give you some height whilst other people waltz about in really comfy pumps. 3. Even worse, when everyone else wears heels, you really really have no choice! Unless you want your face in your friends chests all night…..
5. When you are sharing food with people ‘Kayleigh can have the smaller piece because she’s smaller’ NO! I can sure tell you us small people have a MIGHTY appetite. 7. The nicest clothes are rarely in the petite section, you always like that one item in the standard section or even worse, TALL. 8. Kiss those dreams goodbye of ever wearing a Maxi Dress or Jumpsuit. 10. Just as bad, when you are shopping and having to go up to someone to ask them to reach something for you. What you want always seems to be the item out of reach…. 12. Being a permanent arm rest. 13. ‘Cute’ is the word that you are described as on a daily basis, not always a bad thing but it gets old! 14. Being told you are really short, yes I know. 15. The middle seat in cars, always the most uncomfortable. 16. Not only am I short, I have such a baby face… ID will be glued to me forever. 17. The struggle of trying to keep up with people walking, our little legs have to work so much more! It is so tiring! 18. This also happens with stairs, yes I can only do one step at a time. 19. REALLY tall people always stand or sit in front of me in a concert / cinema. I love staring at the back of a head for a few hours! 20. When you stand on tip toes you are still really really tiny. 21. Cropping your profile or cover photo on Facebook with a group of friends, such awkward times! Someones head is of risk of being chopped. As people always say, at least the men are always taller than you! Too true! I really enjoyed writing this one! Do any of these apply to you? This is totally me! I am 28 next week and still get asked for ID. The most embarrassing one was when I was 20 buying fake nails in a beauty shop, the girl got the manager. She didn't explain why. The manager came over and said you have to be over 13 to buy these because of the glue. I wanted to crawl under the counter. I presented my ID and the manager was really sorry. I am also short. I just tell people I am adorable.